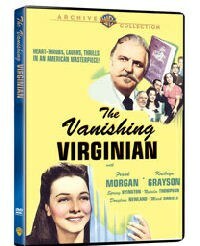 Available on demand from Warner Archive is The Vanishing Virginian, the last film directed by spiritual sentimentalist Frank Borzage for MGM. It belongs to a thriving strand of nostalgic small-town Americana that sprang up in Hollywood during WWII, and whose apotheosis was Meet Me in St. Louis. Other prominent examples include The Human Comedy, One Foot in Heaven and Our Vines Have Tender Grapes. Whether set in the past or the present, all are driven by tension between yearning for a supposedly simpler time and a subtle awareness of upheaval and loss spurred by war, which is sometimes mentioned explicitly and sometimes suppressed. They seem like pleasant escapism on the surface but roil with tensions and uncertainties. The contemporary context of this film is evoked in the opening of the New York Times review: "Despite the strict rationing law on sugar, Metro-Goldwyn-Mayer has gone far beyond the two-lump limit in The Vanishing Virginian". The source material, a memoir by Rebecca Yancey Williams, belongs to a strain of warm books in which writers fondly recall bygone days of large families with supposedly strict yet loving parents, such as Mama's Bank Account and Life with Father. The film is set mostly in 1913 (the first world war is briefly intimated by a newspaper headline about "the Balkan war") and eventually comes up to the significant date of 1929, when the only "crash" mentioned is that our gentle patriarchal hero finally fails to win re-election as district attorney of Lynchburg, thus signaling the end of an era. But don't worry, the last scene is practically It's a Wonderful Life. The Yancey family is headed by the Wizard of Oz himself, Frank Morgan, barnstorming through the house with many mythologically oriented oaths like "Great jumping Jupiter!" His wife (Spring Byington) is a combination of clueless gentility and steel, called her husband "Mr. Yancey" and trying vainly to force him to give up politics. The eldest daughter, who's going to write the book, is played by singer Kathryn Grayson, who gets the chance to show off her operatic chops with a few trills as two small black girls look on in fascination. These are the daughters of the family servants, "Aunt" Emmeline (Louise Beavers) and "Uncle" Josh (Leigh Whipper, best known for a strong impression in Of Mice and Men). These are major supporting characters, as Jan Fortune's script takes care to incorporate the town's African-American citizenry into most scenes instead of pretending Lynchburg was all white like Mayberry RFD. For the most part, the black folks are presented as quietly, resolutely, not quite resignedly following the power structure. There are moments when it almost doesn't seem patronizing. A black funeral brings out Borzage's apparently sincere Hollywood spirituality. There's a trial for a black man accused of murder when he killed another black man in a fight (a time-honored matter of defending his wife's honor), and a family connection causes our D.A., who perceives that the jury intends to vote guilty without paying attention to evidence, to sabotage his own presentation by accidentally smearing ink over his face to make a point about black skin under the guise of making a buffoon of himself. He gets jailed for contempt and the defendant gets five years on a reduced charge of manslaughter, about which Yancey says he'll "speak to the governor." He's not exactly Atticus Finch, but the movie is making more of an effort than you might expect to address a hot topic, albeit one carefully couched in qualifications. The movie's on safer ground when noting such trendy fancies as the Model A Ford and the movement for women's suffrage--cue the bustling cameo by Katharine Alexander as an outspoken woman who moved North and got a divorce, and who would probably star in a more alarming movie. (The TCM website indicates that she's loosely based on Nancy Astor, and one can perceive it.) Elizabeth Patterson also speaks her sassy mind as Yancey's mother, but it's okay because she's old. This film was dated when it came out, and deliberately so, and today it plays as a smooth dispatch from a nostalgic neverland.